How did I actually get from where I was, to where I wanted to be? I knew that a “packing party” wasn’t going to work for me. (Ryan Nicodemus from the Minimalists famously held a packing party, where he boxed up the entire contents of his house, and over three weeks discovered what he needed and what he didn’t. At the end of the three weeks, he discarded everything he didn’t use.) There was no way I could do that. There was no way I wanted to do that. I wanted to take my time and think through my decisions. But I didn’t want to be thinking through my decisions for the next few years! Other than a few decluttering games, I couldn’t really find much information on the “how”. The second was the waste. Everything I read seemed to gloss over the bit where we have to decide what we are going to do with the stuff! It seemed to be whittled down to a few words: “donate, sell or discard.” What was the best way to donate? Where was the best place to donate it? How did I ensure I wasn’t just burdening the already full charity shops? What about selling? And most of all, surely there was a better place for everything else than “discard”? Was it even possible to declutter without sending anything to landfill? I’ve always been passionate about living with less waste. Yes, what that looks like has changed over the years (gone are the days when I thought that recycling everything was good enough!). Decluttering and minimalism have been extensions of this for me: both in terms of resources (owning stuff that I don’t use is a waste of resources) and in the wider sense (wasting my time, energy, money and at times, my sanity). I couldn’t declutter if I thought everything was going to end up in the bin; for me, it would defeat the purpose. I’m know I’m not the only one who feels like this. I know I’m not the only person who dreams of a life with less waste and less stuff, and wants practical steps to achieve it without sending plastic sacks of usable items to landfill! So how does somebody who cares about waste declutter, and what do they do with the things that they no longer need? Those were the questions that I couldn’t find the answers to. Now I’ve got to the end of my decluttering journey, I have those answers, and I want to share them with you. I’ve spent the last few months pouring all of the lessons learned, a-ha moments realised and the actions taken, and I’ve created a resource that I’m really proud of. 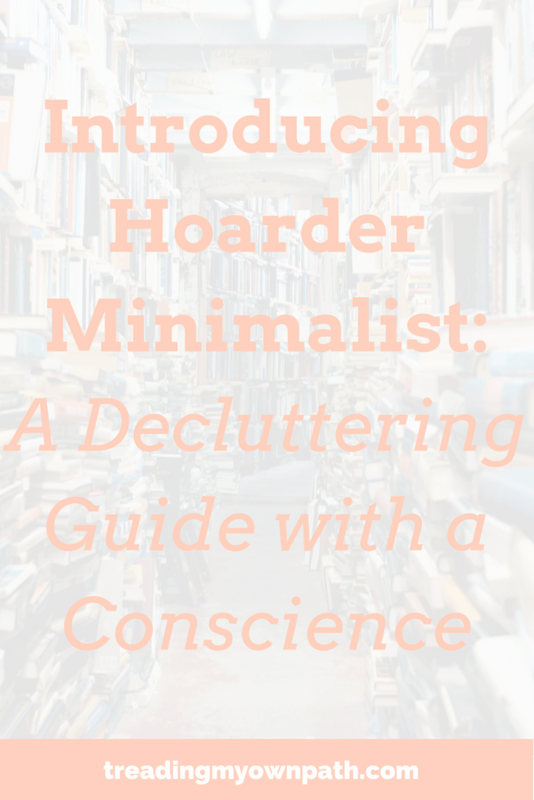 Called Hoarder Minimalist, it’s a comprehensive guide to decluttering with a conscience. It’s not just a bunch of tips and tricks: it’s a practical plan with actionable steps for anyone wanting to live a life with less stuff, who values experiences over things, and who doesn’t want to trash the planet in the process. Decluttering isn’t something that can be finished in a single weekend, but it doesn’t need to take forever! There is an end and you can get there. I know that by sharing my experiences, you will make progress quicker and see results faster. Whether you’ve been decluttering for a while, you’ve just started out, or you’re still in the thinking-about-it stages, the life you dream about is just around the corner… and whist the journey is rewarding, the end is definitely better! After all, it’s about more than stuff. It’s about freedom. Hoarder Minimalist offers a Main Book, a Workbook and a Journey Planner. The Main Book (147 pages) is the roadmap for your decluttering journey: an actionable step-by-step guide to living with less. There’s a whole section devoted to letting go of your items responsibly. The Workbook allows you to explore some of the ideas presented in the Main Book in more detail, and to really personalise them to your own individual set of circumstances. The Journey Planner is for you to track your journey, record your milestones and watch your progress unfold. 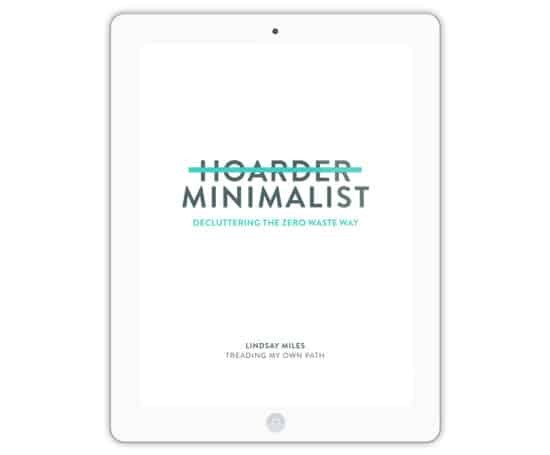 Option One: The Hoarder Minimalist Bundle contains the Main Book, the Workbook and the Planner, and is priced at AU $26.95 (bundled savings $7.95). Option Two: Alternatively, if Workbooks and Planners aren’t your thing, and you don’t want to pay for stuff you don’t need (I get that! You’re decluttering, after all!) 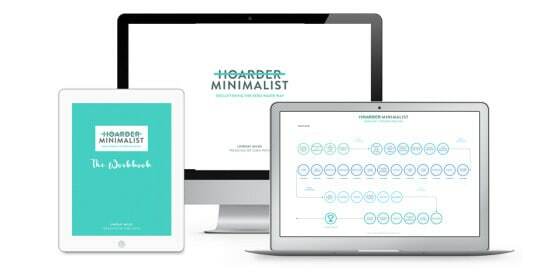 the main Hoarder Minimalist book is available to purchase separately for $19.95. (If you change your mind later on, the Workbook is also available to purchase separately for $14.95). And of course, I cannot wait to hear your decluttering stories! Any revelations, a-ha moments and epiphanies – share them all! I’d love to see any before-and-after pictures too. If you’ve any questions, suggestions or comments, I will be happy to help. I always love to to hear from you. In short, my inbox is always open, as are the comments below! Looks great! Looking forward to purchasing the pack this afternoon! Getting there with the minimalising but have the same issue about doing it in a way that fits in with sustainability too. Then there’s the issue of not allowing things to creep back in. Our family Christmas has progressed from buying each other a present each, to buying one larger present for each person (secret santa) and this year my wonderful mum suggested we skip presents altogether and pool our funds to buy goats (and maybe chickens and vaccinations too) for communities overseas in need- which everyone so far has been on board with. So proud of her! Thank you Sarah! There’s always a more sustainable way to do things, and minimalising is no different! I love your story about the Christmas presents – such a perfect solution. I think when we’ve fought so hard to declutter, we become really conscious of what we accept into our homes. And what a rewarding way to give instead! Go your mum! Hi Lindsay, Is this product electronic only? Can’t seem to find that info on this page.